When you stand at over 6′ 4″, you’re bound to get noticed – and that has certainly been the case with Edwin Minney over the last few seasons. Being one of the tallest goalies available at this year’s draft, Minney clearly has the height advantage on his side, but such a factor definitely doesn’t define him as a netminder. After playing his Midget hockey with the U16 DC Capitals, Minney made the transition to the USHL & USDP as he became part of the USNTDP Juniors and U.S. National U17 Team. Despite the fact that Minney might not have had the best statistics in his first season in the two aforementioned leagues, the goaltender got a chance to face better competition on the ice while receiving some top-notch tutelage from some highly touted coaches. 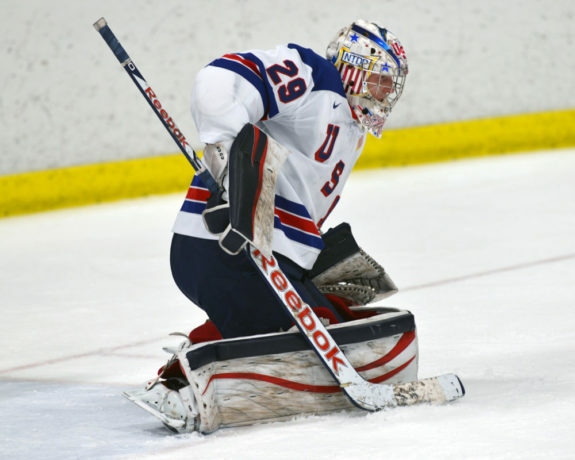 While Minney’s U17 campaign might have had some bumps in the road initially, his U18 hockey season was markedly better as he posted better numbers in both the USHL (17 GP, 2.63 GAA, .905 Save Percentage) and USDP (38 GP, 2.63 GAA, .900 Save Percentage). 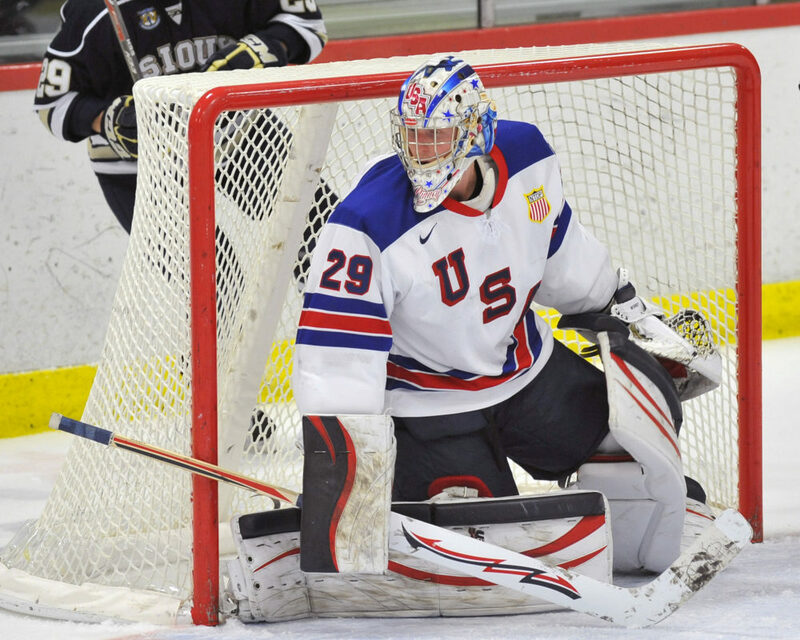 Not only did Minney have a successful season filled with improvements to various facets of his game, he was also chosen to play in the CCM/USA Hockey All-American Prospects Game – a stage in which the netminder excelled as he stopped 16 of 17 shots thrown his way by members of Team Johnson. Playing the butterfly style, Minney is a very composed netminder that can take away portions of the net without having to over-rely on his size. Although Minney might be slightly taller than 6′ 4″, the goalie moves fluidly for an individual of his size – and his lateral movements in the crease are a testament to his ability to move so well with so many working parts in motion. With Minney committed to Michigan State University for the 2014-2015 hockey season, the goalie will have his first taste of NCAA competition, and it wouldn’t be farfetched to expect the netminder to take the lessons that he has learned over his last two years and incorporate them at the collegiate level. The NHL Entry Draft is undoubtedly on the forefront of Minney’s mind – and probably on the minds of his closest family and friends – but the goaltender has done everything in his power to get to this point of his hockey career, and all signs are pointing to that effort paying off on draft day. Minney will most likely be a mid-to-late draft pick at this year’s NHL Entry Draft. Seeing as how Minney has the size that NHL teams covet, it’s hard to envision him being passed over. Minney played in four games for Team USA at the Youth Olympic Games during the ’11-’12 hockey season and was also a member of the USA U17 & U18 teams for the WHC-17 & WJC-18. Good coverage of lower portion of the net. Slight work on rebound control. Slight filling out of body frame.